When Belgian lawmakers announced a corporate tax overhaul in April 2016 as part of budgetary control initiatives, local companies large and small cheered. But 15 months later, they are asking: Where is our tax relief? At 40 percent, Belgium has the third-highest corporate tax rate of 35 OECD member countries, topped only by the U.S. with its 38.9 percent rate and France with its 34.4 percent, and both U.S. President Donald Trump and French President Emmanuel Macron have announced plans for tax cuts. If and when that happens, in no other industrialized country would companies be taxed as heavily on their profits as in Belgium. When Belgium Finance Minister Johan Van Overtveldt was tasked by the federal government with designing a blueprint for a corporate tax system overhaul, hopes were high. 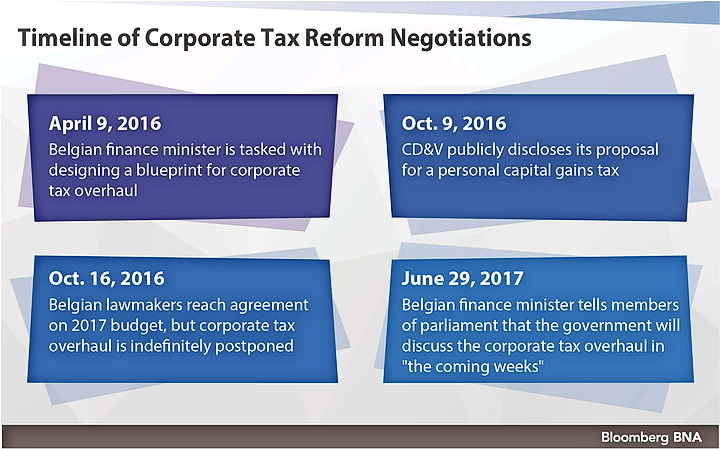 All four governing parties appeared to agree that the Belgian corporate tax regime, with its high nominal rate and many exemptions and breaks, needed to be changed, but more than a year later, the wait is still on. According to companies, practitioners, and lawyers interviewed by Bloomberg BNA, this tax burden is no longer tenable. Erwin De Meyst, tax director at the Belgian Finance and Services Division of ArcelorMittal, the world’s largest steel company and one of the country’s biggest private employers, told Bloomberg BNA a rate reduction is imperative to keeping local companies competitive. According to the American Chamber of Commerce (AmCham) in Belgium, failure to bring the corporate tax rate down soon would be a “catastrophe” for both the country and for foreign companies. “They really need to do this—this is an investment in the future; it’s an investment in investment and in economic growth and job creation,” Chief Executive Marcel Claes told Bloomberg BNA June 26. He noted that low interest rates had reduced the appeal of Belgium’s notional interest deduction, a tax exemption that allows companies to deduct fictional interest payments from their taxable income and that is based on interest rates on 10-year government bonds. “You’re totally outside of the international competition, and with the reduced impact of the notional interest deduction, a lot of companies are paying a rate which is not far removed from 34 percent,” he said, adding that large domestic and foreign companies account for roughly 1.5 million of the 4 million jobs in Belgium’s private sector economy. Timmermans told Bloomberg BNA June 30 that the high nominal rate deters local companies from investing in new production methods, buildings, digitization processes, and new technologies and machinery. He pointed out that the headline rate, together with Belgium’s 30 percent withholding tax on dividend distributions, resulted in “very high taxes on the profits realized by companies”. He said the high tax burden has ripple effects, incentivizing local companies to invest abroad rather than domestically and discouraging investors—both private and professional—from buying shares in Belgian companies. Lawmakers have struggled to sign off on a corporate tax overhaul for two reasons: one fiscal, the other political. First, the government doesn’t want a rate reduction to create a further budget deficit, which the European Commission expects to be 1.9 percent of the country’s GDP this year. Any revenue lost in corporate taxes must be offset with increased revenue, lawmakers from all four ruling parties have insisted. “In that sense, it’s not a reduction, but a shift,” Jos Goubert, head of KPMG’s tax knowledge and research center in Brussels, told Bloomberg BNA. “The corporate tax revenue is supposed to remain the same, but someone will have to foot the bill,” he said June 28, noting that either Belgium’s participation exemption will have to be adjusted, the notional interest deduction scrapped, or corporate capital gains taxed differently. “So, that’s the first problem: they want a compensation” within the corporate taxation revenue, he said. But lawmakers should be willing to at least spring one or two billion euros on the corporate tax overhaul, Claes said, pointing out that the real budgetary impact of failure to bring the rate down would be plummeting social security contributions and an increase in unemployment benefits when Belgium’s high nominal rate causes multinational companies to lay off workers and pack up their bags. “So, very clearly, not doing anything is not budget-neutral,” he said, adding that the business group is in favor of reducing the headline rate to 20 percent by 2020. The other stumbling block is that the negotiations have sharply divided the three-year-old center-right government, with the Flemish Christian Democrats (CD&V) in one corner, and the Flemish nationalist party (N-VA), the Flemish Liberal Party (Open VLD), and the French-speaking liberal party (MR) in the other. 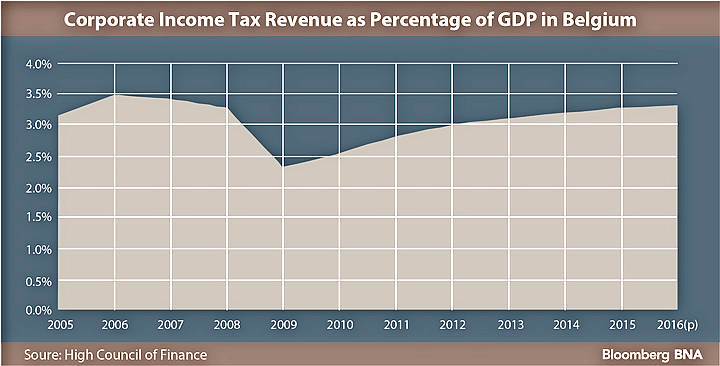 Arguing that a fairer taxation system was necessary, the Flemish Christian Democrats refused to sign off on a rate reduction in October 2016 unless a 30 percent personal capital gains tax was simultaneously introduced. “This demand has deadlocked the negotiations at the political level because this is somewhat of an unacceptable demand for the other parties,” Goubert said. After the negotiations deadlocked in October 2016, Belgian Prime Minister Charles Michel took the reins from Finance Minister Van Overtveldt and started leading the negotiations between divided lawmakers. Lawmakers are expected to agree on a reform by the end of July, but a spokesperson for the prime minister refused to confirm this date, citing the ongoing negotiations. Not all large companies would equally benefit from a corporate tax cut. A 2016 analysis by ING bank sent to Bloomberg BNA found that companies that realize a large part of their profits in Belgium and that are expected to face high tax bills in 2020, such as telecommunications operator Orange Belgium, supermarket chain Colruyt, and property developer Immobel, are most likely to reap the fruits of the overhaul. Siddy Jobe, director of investor relations and corporate finance at Orange Belgium, told Bloomberg BNA that not many preferential regimes have been open to the telecoms company. “Our effective rate, as a result, has so far been very close to the statutory rate,” he said, adding that they would welcome a tax cut because it would bring their effective rate down by default. “That would be a positive contribution to our bottom line,” he said July 12. A spokesperson for Colruyt Group confirmed ING’s analysis, but declined to comment otherwise. A spokesperson for Immobel didn’t respond to requests for comment. According to Annelies Nauwelaerts, a spokesperson for furniture giant IKEA Belgium, a lowered corporate tax rate will predominately benefit Belgian companies that produce or export abroad and that compete with foreign competitors. “As far as we are concerned, we think the impact of rate reduction would be rather limited for us because we are a retailer, and because we’re active in Belgium,” she told Bloomberg BNA June 30. The urgency of companies’ calls on lawmakers to deliver on their April 2016 promise belies that Belgium’s high nominal rate goes way back. It has stood at 33.9 percent since 2002, when the then government reduced it from 40.2 percent. Since then, Belgium’s corporate tax regime has combined a high nominal rate with various preferential regimes that can significantly narrow companies’ tax base, resulting in an average effective rate of 26 percent, Van Overtveldt told Bloomberg BNA in April 2016. In a 2016 report, the High Council of Finance, which advises the government on fiscal and financial matters, warned that an overhaul of Belgium’s corporate tax regime pairing a lowered rate with a wider tax base was necessary because several of the country’s preferential regimes—which include risk capital deductions and a tax break for patent revenue—will have to be adjusted as part of the European Anti-Tax Avoidance Directive (ATAD). Belgium must implement this directive into its national laws by Dec. 31, 2018. “We have to reform our system of high rates and special deductions because all those deductions are under pressure,” he said in a June 29 email. Haelterman added that such an overhaul would help attract “operational and logistic investments” and the attendant jobs to Belgium, to replace the country’s previous appeal as a destination for multinational headquarters and financial centers. “In the absence of a reform and a reduction, Belgium will soon disappear from all short-lists for such new investments, and Belgium will very shortly start appearing on divestment short-lists,” he said. This view was echoed by Goubert, who noted that Belgium’s lackluster appeal to foreign companies due to its high statutory rate was reflected in the limited number of companies that have announced they will move units or offices to Belgium in the wake of the UK’s decision to leave the European Union. “You can see there that we don’t really appear on most of those short-lists; you often already bump off in the first round because of the high rate,” he said. “The problem is that when multinationals or companies have to pay less, the money is either sought elsewhere or cuts are made to public services that threaten to further increase inequality,” she said.